Plenty of us struggle, in the age when so many traditions in so many parts of the world now seem perpetually up for revision, with the choice of whether to get married. It even confounded no less a mind than that from which On the Origin of Species by Means of Natural Selection flowed. This happened back in 1838, over twenty years before the publication of that most important book in biology. And, for a moment, it must have seemed almost as vexing as the question of how all the species came about. And so Darwin reaches his conclusion: "My God, it is intolerable to think of spending ones whole life, like a neuter bee, working, working, & nothing after all. — No, no won't do. — Imagine living all one's day solitarily in smoky dirty London House. — Only picture to yourself a nice soft wife on a sofa with good fire, & books & music perhaps." He would indeed marry and spend the rest of his life with Wedgwood, a union that produced ten children (one of whom, Francis, would go on to informally illustrate On the Origin of Species manuscript pages). 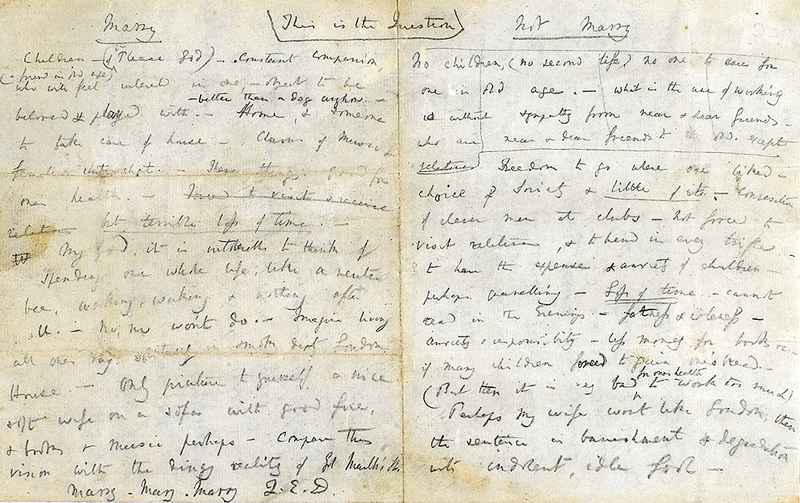 You can peruse the full list, even in Darwin's own handwriting (if you can decipher it), at Darwin Online. If he went on to write a list of his secrets of a successful marriage, Darwin scholars haven't yet discovered it, but I think we can safely say that it would include at least this recommendation: think the decision through, but don't let it keep you from your life's work.